The Rise of Reckless Driving. Photo by Elliot Hughes. One night last November, Nicole Demmith was washing the dishes at her home near the intersection of Muskego and Becher streets when she heard yet another car accident outside her door — only this one came with a particularly awful clap of thunder and metal. She ran outside, same as always when she hears an accident. An SUV was engulfed in flames on the sidewalk at the intersection. Workers from a nearby convenience store ran out and took an extinguisher to the fire. Demmith and several others helped extricate the driver, Hector C. Hernandez, whose clothes had been burned off. She covered him with her sweater. The other vehicle in the two-car crash had no occupants inside to attend to. Hernandez, 36, had been westbound along W. Becher Street and had the green light to cross Muskego Avenue. But another car, traveling south on Muskego at a “high rate of speed,” ignored the red light and slammed into Hernandez’s car at a 45-degree angle, according to the police report. The two occupants of the speeding car ran off as Hernandez remained trapped in a burning vehicle (one has since been arrested and charges are pending). Hernandez, who was engaged to be married, died at a hospital that night. Meanwhile, Hernandez’s car struck two parked vehicles, one of which was totaled and has left its owner, Demmith’s neighbor, struggling to get to work. Demmith said the crash still affects her sleep. The next day, Ald. Bob Donovan, who represents the area, held a press conference. With the scene of the accident at his back, he characterized what happened the previous night as a “murder.” Hernandez’s death would be one of 64 traffic fatalities in Milwaukee in 2017. “Milwaukee is plagued with unsafe drivers and that somehow needs to be addressed,” he said. In interviews and at various public meetings, dozens of residents and officials have said they feel uncertain every time they drive in Milwaukee. Even when a light turns green, they said they hesitate to continue on out of fear. Cars driving in bike lanes, vehicles running red lights and stop signs, speeding and deadly hit-and-run accidents have become far too commonplace, they said. Not only that, but, up until last fall, it seemed many reckless drivers were going unpunished. From 1996 through 2013, traffic crashes typically killed 30 to 40 people in Milwaukee every year, according to the Milwaukee Police Department. And from 1996 through 2011, the number of injury crashes fell 46.3 percent. But now those numbers are climbing. Forty-nine people were killed in 2014, followed by 64 in 2015, 57 in 2016 and 64 in 2017. From 2012 through 2017, injury crashes jumped 26.9 percent. City officials, community leaders and residents acknowledge the problem is widespread throughout Milwaukee, although North Side neighborhoods appear to be suffering the most. 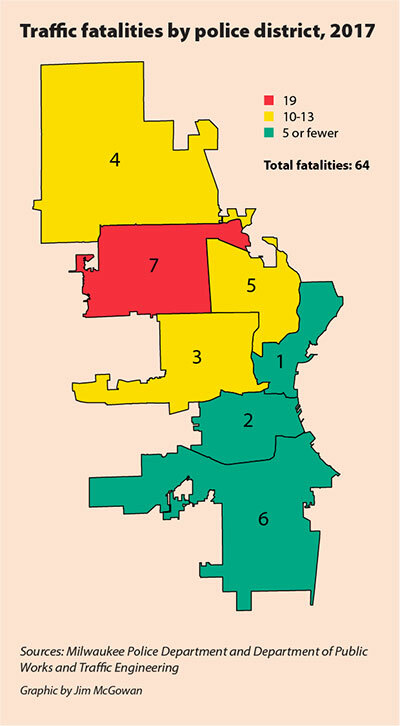 During the last two years, the aldermanic and police districts on the North Side have logged the most traffic fatalities, according to MPD data. In 2016, there were 56 intersections in Milwaukee that had 15 or more crashes. The majority of them occur on North Side streets — the main culprits being West Capitol Drive, West Fond Du Lac Avenue and West Hampton Avenue. As things started to get worse during the early 2010s, Milwaukee police struggled to keep up. Calls for service for reckless driving leapt 136 percent from 2010 to 2016, according to MPD data. 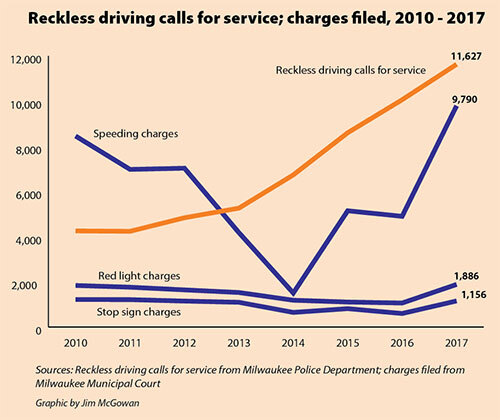 But the number of charges filed for speeding, failure to stop at red lights and failure to stop at stop signs all fell between 42 and 51 percent during the same period, according to Milwaukee Municipal Court. At the same time, MPD operated under a policy that limited when officers could engage in vehicle pursuits. The policy forbade officers from pursuing unless they had probable cause that the vehicle or its occupants had been involved in a violent felony. Even with that narrow opportunity to pursue a suspect, officers still engaged in 306 pursuits in 2016, the most since 2002, according to an MPD study. But apprehension rates nosedived. Once as high as 91.2 percent in 2010, they fell to 36.6 percent in 2016. That pursuit policy changed last September after the Fire and Police Commission ordered Police Chief Edward Flynn to loosen it. Officers are now also allowed to pursue vehicles if they are suspected of drug dealing, or if they are driving recklessly. One month after MPD’s pursuit policy changed, so too did the department’s strategy for attacking the city’s traffic ills. 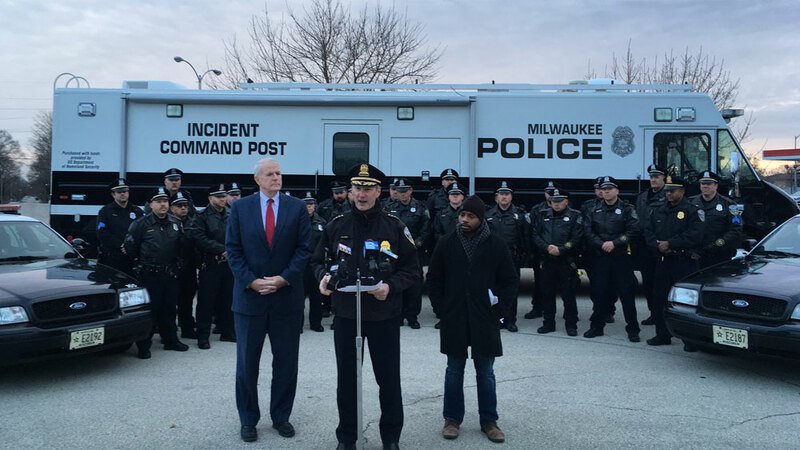 Since mid-October, in what is referred as “the surge,” MPD has poured resources into 56 areas throughout the city with high volumes of traffic infractions, violent crime and general disorder, according to officials. Seventeen of Milwaukee’s top 20 intersections with the most crashes are covered by the surge, Lt. Derrick Harris said. Those areas now see a swarm in police presence, and many Milwaukeeans have felt it. In December, after 62 days of the surge, Flynn appeared at an outdoor press conference in full regalia, with two dozen cops and three police vehicles staged behind him. He reported that when comparing the 62-day surge with the previous 62 days, car crashes fell citywide by 9 percent, crashes in the 56 surge areas fell by 12 percent and traffic stops increased 56 percent. Stops that resulted in a ticket jumped 111 percent. In addition, preliminary Wisconsin Department of Transportation data indicated traffic crashes citywide declined 21 percent in October and November 2017 compared to the same months in 2016. Meanwhile, the number of charges filed in municipal court in 2017 for speeding, failure to stop at a red light and failure to stop at a stop sign were at their highest since 2011. Initially a temporary strategy, Flynn, who is retiring Feb. 16, said at the news conference that MPD would fold it into its permanent game plan for handling crime. The surge has not gone unnoticed, either. 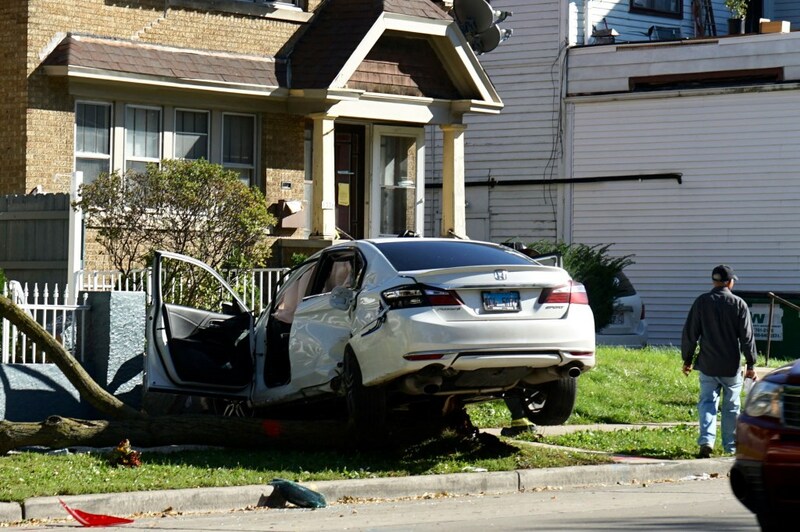 Demmith, the woman who witnessed the fiery South Side crash, and North Side residents have reported seeing more police pouncing on drivers. 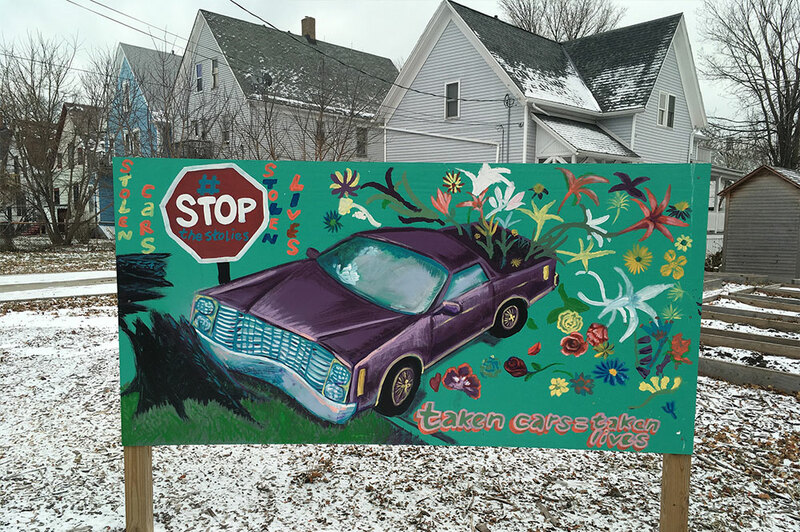 Artwork in Lindsay Heights warns passersby of the dangers of car theft and joyriding. Photo by Elliot Hughes. There’s no clear explanation for the rise of reckless driving in Milwaukee, but officials, community leaders and residents have their theories. They mainly fall in four categories: youth culture, neglect, lack of driver’s education and police policies. Picture the stereotypical idea of what is cool to a high schooler: You want to have a car and because there isn’t much to do in your free time, you cruise around aimlessly. The way some people see it, that cliché has evolved into a practice of stealing cars and then not just cruising, but driving carelessly, courting police and evading them. It’s unclear how often a teenager is behind the wheel during instances of reckless driving, but youth take much of the blame when officials and community leaders speak on the matter. MPD’s study on vehicle pursuits noted that in the early 2000s, a pursuit subject was likely to be middle-aged. But in 2016, when there were more pursuit subjects than in the previous 14 years, half of the drivers were 18 or younger. Kalan Haywood II, a recent high school graduate and former president of the city’s Youth Council— which led a public service announcement project about driving responsibly — described reckless driving and escaping police as a way of gaining social currency. This isn’t necessarily new. State Rep. David Crowley, who has proposed legislation allowing automated traffic cameras in Milwaukee, said he knows adults who talk as if red lights are optional. He related a story in which a cousin of his, in his late 20s, thought he was justified running a red light if he was late to an appointment. City officials and community leaders have asserted that too many youth in Milwaukee are victims of neglect. Many believe that they are abandoned and not cared for, which pushes them to act without consequences in mind, according to Earl Ingram, a radio host who speaks at schools about car theft. “Stealing a car is fun to them; it adds excitement to their lives,” Ingram said at a town hall meeting about Crowley’s proposed camera legislation. “They feel like the society in which they live, makes them the type of people that they are. For the last 14 years, driver’s education programs have not been as accessible to teens as they once were. Students in Milwaukee who received free or reduced price lunches used to have free access to driver’s education. But that ended in 2004 when the state government stopped funding the program in schools. Since then, Milwaukee Public Schools charged students $150 to take driver’s ed, which is less than half of what some private companies charge. But that is still “not accessible by all of our families,” MPS spokesperson Andrew Nelson said. According to a 2015 study by University of Wisconsin-Milwaukee’s Employment and Training Institute, 83 percent of black male teens in Milwaukee do not have a license, compared to 36 percent of white male teens in the suburbs. Teenagers from low-income households in the inner city of Milwaukee, no matter what race or gender, are unlikely to have a license, the study found. Thirty-six percent of low-income, white males have a license, the highest rate among the demographics studied. Meanwhile, 13 percent of low-income Hispanic males had licenses — the lowest rate. In 2016, MPS began MPS Drive, a program that charges students only $35 to get a temporary driving permit. Funded in part by public donations, the program is currently available to 2,400 students on a first-come, first-served basis. The goal, Nelson said, is to serve 6,000 students annually by the 2020-21 school year. Nobody denies the benefits of increased access to driver’s ed, but not everyone is convinced it will help curb reckless driving. From left to right, Mayor Tom Barrett, Police Chief Edward Flynn and Ald. Cavalier Johnson stand in front of two dozen officers in December as Flynn recites the accomplishments of the first 62 days of MPD’s “traffic surge” in response to rampant reckless driving in the city. Photo by Elliot Hughes. MPD adopted the policy of pursuing only vehicles with a probable cause connection to a violent felony in 2010. In the years since then, critics said the policy made public that there were offenses that would not likely carry consequences. Flynn argued the policy avoided the dangerous pursuits that have killed innocent bystanders in the past. Haywood, the former Youth Council president, said he’s seen social media postings from his peers boasting about, and encouraging, fast, erratic driving if police ever show up in the rear-view mirror. The assumption is that police won’t give chase. “I was seeing people encourage it on Facebook: ‘Keep going, don’t stop,’” he said. But other cities in the U.S. still have pursuit policies similar to MPD’s 2010 policy, Flynn has pointed out, and those cities do not have a reckless driving problem. “There are other variables,” he said after the Fire and Police Commission ordered the change. The policy was broadened last September, allowing officers to pursue a subject who is driving recklessly, regardless of whether a violent felony may have been involved. But now some expect there to be a learning curve among the populace. Although the accident on Muskego and Becher streets rattled her and others, Demmith described her neighborhood as one that had become more close-knit in the weeks since it happened. That kind of thing isn’t just happening on her South Side block, either. Over in Grassland Manor, residents have rallied around the sometimes-treacherous West Fond Du Lac Avenue and nearby West Capitol Drive, holding weekly neighborhood watch meetings and marching down sidewalks with picket signs. And many people seem to understand that reckless driving has become too complex an issue to be quickly fixed. In October, the day after some goofing around ended with a 16-year-old boy being thrown from the hood of a car and killed at 12th and Concordia streets, 40 community members — including grassroots leaders, state representatives, neighborhood children and family of the deceased — held court in front of a modest media scrum at the scene. For a half-hour they pleaded for greater access to driver’s education. They pleaded for people to hold each other accountable. They pleaded for parents to watch their kids better. They pleaded for perpetrators to just slow down. But halfway through it all, they were interrupted by an SUV that came squealing and speeding down 12th Street and turned east onto Concordia, barreling through a four-way stop where 40 people were standing. Two motorcycle cops were on hand and chased the car down an alley. Minutes later, the two cops returned to the intersection looking sheepish. They said the driver ditched the car in the alley and ran off. So…Policing works? Novel concept. All joking aside, i’m happy that we are finally fixing the issue. As a resident of the ward with the highest traffic fatalities in the city, this article scares me. I totally agree with my Senator Lena Taylor. The kids today are not breaking the law they do not know the law. Once more we are paying the price for the drastic tax cuts and cuts in programs once provided by the state. Why does this article not talk about the tragic way so many of our streets are engineered? The city actually knows how to build safe, economically productive streets; streets that create vibrancy, not tragedy. The City’s actually done it several times: Broadway in the Third Ward, S. 5th street through Walkers Point, Mason Street by the new Northwest Building. In each place, the city has engineered streets to slow traffic through areas of high concentrations of people & economic activity and the result is an enjoyable, successful place. 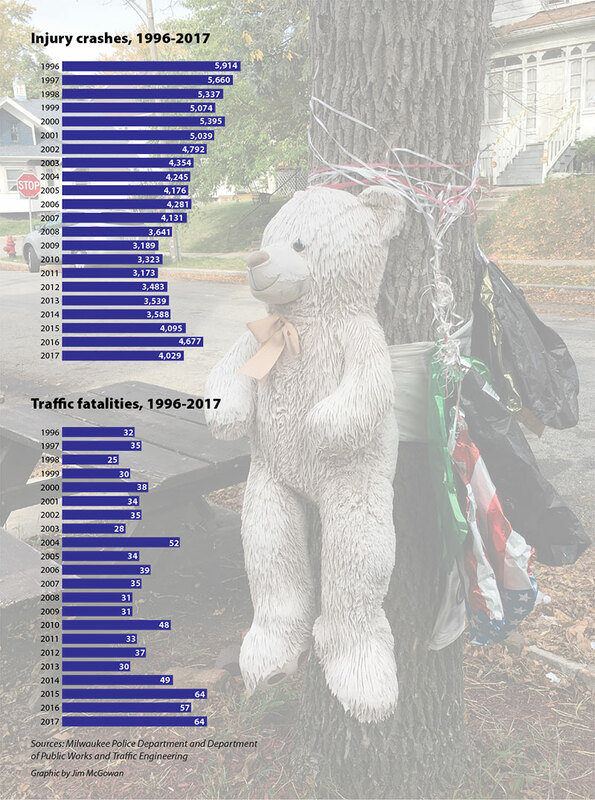 Where these deaths are happening are on our City’s numerous 4 lane death roads; a dangerous, antiquated street design that Milwaukee has been a laggard to correct. These streets (27th, North, Capital, Holt, Howard, Oklahoma, etc. etc.) are dangerous to all road users, suppress pedestrian activity, and reduce quality of place for neighborhood residents. We need to stop blaming people that paid the ultimate price and start building places that are safe and productive. People run red lights and stop signs without a thought. Cars speed through neighborhoods and intersections without giving a glance to see if anyone else is on the road. People drive without licenses and without insurance. They drive in the emergency lane on the freeway so they can pass other drivers or get to their exit ramp more quickly. And they drive 30 or 40 miles per hour faster than the posted speed, showing irritation at other cars in their lane if they are not doing the same. No one uses traffic signals–they might as well be optional equipment on vehicles. These drivers think the rules don’t apply to them. It is a road rally out there and it gets worse by the day. I’m not sure what the answer is. But I have become a hesitant and very defensive driver, as a result. Must be the lead in the pipes that causes people to drive like this. This applies to pedestrians too.. I can’t count how many people I see crossing against the light without even looking. I agree with Rich. Curb bump-outs at the most dangerous intersections would make it impossible for cars to pass on the right through the bike lane when speeding through a red light or passing a cue of cars once the light turns green.